These plastic ski-tuning reference cards are shipped with every WhisperFin. They are virtually indestructible so they can live in wet ski bags. Just in case you’re on your smart phone, its text is provided below for improved clarity. 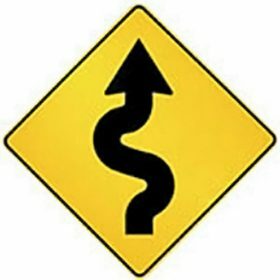 The smaller you run your WhisperFin the better—right up until the tail gets too slippery at the very end of turns. The further forward your bindings, the smaller the fin can be. Goal: optimize this fin/binding relationship. Binding location affects tail-slide (smear) everywhere, but mostly at maximum lean angles through mid-turn. This is because the steeper the ski is rolled onto its edges, the less effect the fin has (see first illustration). Moving your bindings changes the distance from your front boot to the back of the ski. This changes the tail’s area, length and its leverage against smear. So if your ski turns like a school bus, moving the bindings back puts more load on a smaller tail, increasing smear. If the tail is too slippery mid-turn, moving the bindings forward increases tail support, reducing over-smear. To achieve the full benefits of minimal fin area, you’ll likely need to move your bindings forward to control smear. You’ve moved too far forward if the ski’s tip no longer provides enough support and starts digging in or washing out. But we usually run out of forward binding adjustment before tip-related issues occur. If an attempt to further reduce fin area creates more smear than can be controlled with binding location, increase fin area until the tail of the ski sweeps around the turn into perfect cross-course angle. 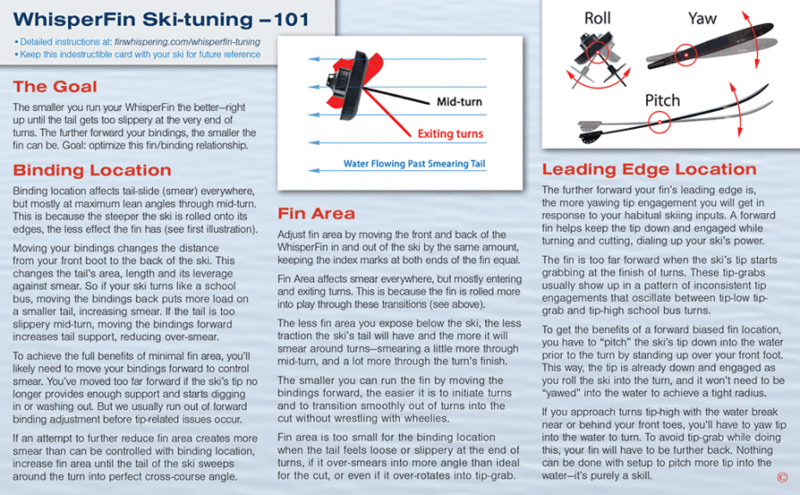 Adjust fin area by moving the front and back of the WhisperFin in and out of the ski by the same amount, keeping the index marks at both ends of the fin equal. Fin Area affects smear everywhere, but mostly entering and exiting turns. This is because the fin is rolled more into play through these transitions (see above). The less fin area you expose below the ski, the less traction the ski’s tail will have and the more it will smear around turns—smearing a little more through mid-turn, and a lot more through the turn’s finish. The smaller you can run the fin by moving the bindings forward, the easier it is to initiate turns and to transition smoothly out of turns into the cut without wrestling with wheelies. Fin area is too small for the binding location when the tail feels loose or slippery at the end of turns, if it over-smears into more angle than ideal for the cut, or even if it over-rotates into tip-grab. The further forward your fin’s leading edge is, the more yawing tip engagement you will get in response to your habitual skiing inputs. A forward fin helps keep the tip down and engaged while turning and cutting, dialing up your ski’s power. The fin is too far forward when the ski’s tip starts grabbing at the finish of turns. These tip-grabs usually show up in a pattern of inconsistent tip engagements that oscillate between tip-low tip-grab and tip-high school bus turns. To get the benefits of a forward biased fin location, you have to “pitch” the ski’s tip down into the water prior to the turn by standing up over your front foot. This way, the tip is already down and engaged as you roll the ski into the turn, and it won’t need to be “yawed” into the water to achieve a tight radius. If you approach turns tip-high with the water break near or behind your front toes, you’ll have to yaw tip into the water to turn. To avoid tip-grab while doing this, your fin will have to be further back. Nothing can be done with setup to pitch more tip into the water—it’s purely a skill.